The Times of India is fast becoming one of my favorite papers. Even the most serious stories are written in a loose, conversational style; when they can’t get a photographer out to an event, like a gang fight or a city council meeting, in time, they have the cartoonist provide a light hearted imagination of the scene; and when the society page publishes photos of the gliterati out at some shiny new lounge, they don’t tell you the name of the venue our its location, leaving you to simply envy the better heeled without providing the opportunity to actually rub shoulders with them. Here are some headlines from yesterday’s paper, and a quick summary of the stories behind them, as best as I can work out. This article is accompanied by a picture of a police officer getting ready to beat the hell out of a kid who is cowering and looking directly at the camera, which seems to capture what’s going on in the capital pretty well. Evidently, the Indian Supreme Court ruled that Delhi had to crack down on unlicensed businesses. So the city started shutting down, or ‘sealing,’ many businesses, largely in poorer residential neighborhoods. This lead to riots against the police, who claim they couldn’t control the protests with tear gas and water cannons, so they opened fire on the crowd with live ammunition, killing at least three, including one minor, as of press time. These headlines are literally side by side on this morning’s Bangalore addition. The ‘fever convulsing’ in Delhi is in fact a major set of riots and police-on-citizen violence, which might make you think that the ‘Panic in schools’ could be nothing less than total war in the hallways of Bangalore’s educational institutions. Fortunately, it is nothing quite so severe, but it is a strange and troubling story none the less. From what I can gather, the state’s education minister is angry that many local schools are teaching too much English. That is a problem, presumably, because any instruction of or in English comes at the expense of of instruction of or in Kannada, the local language which the state goes to great lengths to preserve. The remedy to this perceived problem from the education ministry is to shut down these schools, several hundred at least, and presumably move the students to other schools where the instruction will focus more on Kannada. The ‘panic’ is over where, exactly, all these students and teachers are to go and whether the shutterings are really going to happen or whether it’s just a political threat to bring the school Principals in line with the central authority. Compounding the problem is the fact that these are state schools serving the children of the poor, and often illiterate, who want their children to receive instruction in English so that they might find better lives, but who are too politically disenfranchised to do anything about it. 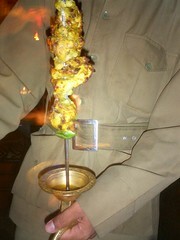 Greetings again from the subcontinent. Despite the lack of evidence provided in this space, I did in fact survive and enjoy the remainder of my travels in July. 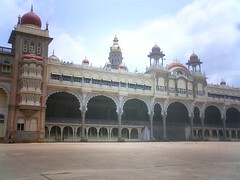 In fact, since this space was last updated, I explored three south Indian states, blasted through Delhi before Hong Kong blasted through me, finished a handful of books, made it back to California, bought a car, learned the wiggle and the MUNI, celebrated a birthday, went to New York for the best wedding ever, and have returned to Bangalore. A blogger of nobler spirit would certainly have provided more timely coverage of these events, but jet lag, work, and 500 channels of cable all intervened. I’ve been back here almost a week now and have finally come to understand that these blog posts aren’t going to write them selves, and that I was going to have to create time to get it done. So, realizing that my only down time so far has been while stuck in traffic, I am composing this post on my Treo in the back of my car on the way to dinner. This is to be a quicker trip than the last, just two weeks, and it will not afford the opportunities for leisurely travel so far afield as the last trip did. That’s not to say I’m not enjoying it, but I am finding that the lens through which I’m seeing this city has a different tint when the promise of further travel to new places isn’t backing it up. Bangalore continues to be an environment in rapid flux. I’m not sure that the traffic isn’t worse now than it was two months ago, and buildings I saw them pouring concrete on last time are now bustling centers of industry. Meanwhile, I’m experiencing the surreal pleasure of becoming a known regular at places in a foreign city in which I don’t live. I’m going to do my very best to capture and publish my observations in a slightly more expedient manner, and I’ll also be getting up to date on the balance of my adventures. So keep your RSS readers running, because we’re off to the races. 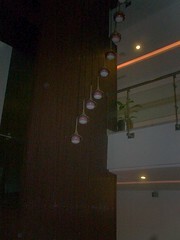 I finally went upstairs the other night, to Gufha, the totally over the top cave/safari theme restaurant on the top floor of my hotel. 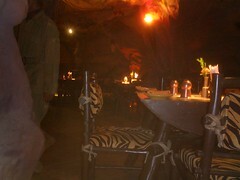 The whole interior of the place is covered with paper mache rock formations, the waiters all wear safari outfits and pith helmets, and the only light is provided by fake flaming torches. I was in a bit of a hurry, because I’d been working late and had a call with California later in the evening, so I just ordered a kebab. It arrived, as you can see above, on fire. One of the things you get used to here in India is that sometimes things are on fire that maybe you weren’t expecting to be (see also, blue shots). You learn to roll with this sort of surprise, and enjoy the tasty results. These small country roads, on the way back to Bangalore from Halebid, reminded me, vaguely, of the country roads around my Father’s home town in western Pennsylvania. Of course, we were driving on the wrong side and the vegetation was distinctly more tropical, but the basic spirit seemed the same. For my second weekend day trip, we drove west from Bangalore about half way to the coast, stopping off to see the world’s largest free standing monolith at Sravanabelagola, and the ancient temples at Belur and Halebid. 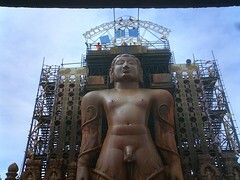 The monolith is a major Jain pilgramage site, and is situated on top of a mountain with some 700 steps carved into its side to huff up. 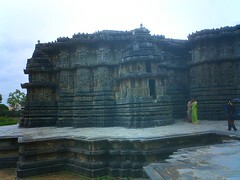 The temples were constructed a few miles apart over a number of generations in the 11th and 12th centuries. I can’t do justice to the history or significance of these sites, so what follows is a pure photo essay of what I saw. 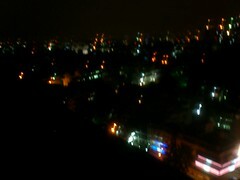 Tonight is my last night in Bangalore. 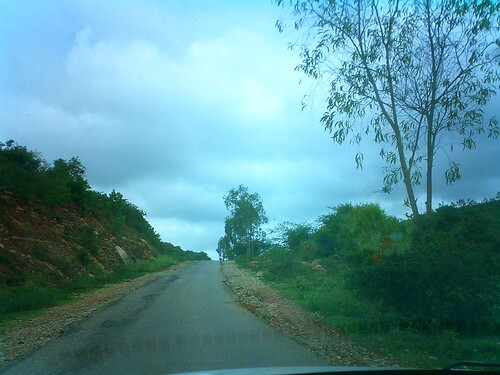 I’ll be heading out bright and early tomorrow and heading south west to an old hill station in Tamil Nadu, a small state in central southern India. I’ll be spending the weekend there, chillaxin’ and enjoying the mountains and the forests. From there I’ll be heading down to the backwaters along the south western coast in the state of Kerala for a couple more days of pure R&R before flying up to Delhi on Tuesday. 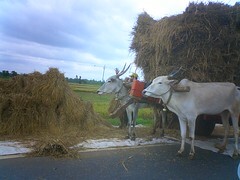 Wednesday I’ll be taking a day trip from Delhi down to Agra to see the Taj Mahal. Thursday I’ll be taking in the sites of Delhi before flying out in the evening and arriving the next morning in Hong Kong. Sunday night I’ll fly out of Hong Kong, and have one of those super fun 14 hours flights where I’ll arrive at SFO two hours before I took off from Hong Kong. 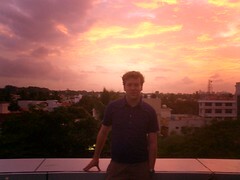 I’ve had a very enjoyable and highly productive stay in Bangalore, and I look forward to returning. At the moment, however, I’m ready for some time off and some varried sites. I’m going to try to get caught up a bit here before I leave, but I don’t think I’ll be updating this space very much next week while I’m on the road. Expect full recaps of my travels to start flowing in after I get back to California and start shaking off my jetlag. News is trickling in on the bomb attacks in Mumbai earlier this evening. I am no where near Mumbai at the moment, and am perfectly safe, but many many people are not. My camera does not perform particularly well in low light, and those have been the circumstances of most of my explorations of Bangalore’s various hospitality institutions, so you will have to forgive me if I ask that you use your imagination on some of these descriptions, and feel free to browse my various photo archives for the relatively low quality shots I have gotten. 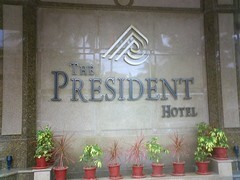 Beginning at the start, my home away from home for my stay in Bangalore is The President.